Are you a policyholder, provider or do you represent an agency office? The Atlantic Coast Life Web Portal is a simple platform providing you with instant access to all your data. Atlantic Coast Life Web Portal, Please login. 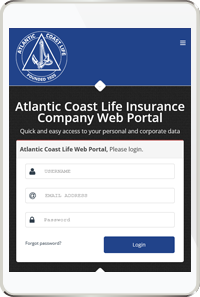 With portability in mind, the Atlantic Coast Life Insurance Company Web Portal was designed using the latest technology to ensure compatibility with all modern smart phones and tablet devices. All the information you need is just a tap away!